Phonon band structures, thermodynamical properties. All the necessary input files to run the examples can be found in the ~abinit/tests/ directory where ~abinit is the absolute path of the abinit top-level directory. To execute the tutorials, you are supposed to create a working directory (Work*) and copy there the input files and the files file of the lesson. The files file ending with _x (e.g. tbase1_x.files) must be edited every time you start to use a new input file. You will discover more about the files file in section 1.1 of the help file. export ABI_TUTORESPFN=$ABI_TESTS/tutorespfn/       # Files specific to DFPT tutorials. export ABI_TUTOPLUGS=$ABI_TESTS/tutoplugs/         # Examples using external libraries. export ABI_PSPDIR=$ABI_TESTS/Psps_for_tests/       # Pseudos used in examples. The last line adds the directory containing the executables to your PATH so that one can invoke the code by simply typing abinit in the terminal instead of providing the absolute path. The standard output of the application is redirected to log while err collects the standard error (runtime error messages, if any, are written here). This tutorial should take about 1 hour. Visualisation tools are NOT covered in this tutorial. Powerful visualisation procedures have been developed in the Abipy context, relying on matplotlib. See the README of Abipy and the Abipy tutorials. Before beginning, you might consider to work in a different subdirectory as for the other tutorials. Why not create Work_rf2 in $ABI_TUTORESPFN/Input? It takes about 3-5 minutes to be completed on a PC 2.8 GHz. In order to do interatomic force constant (IFC) calculations, and to compute associated phonon band structure and thermodynamical properties, you should first have some theoretical background. Let us assume that you have read the litterature relative to the first tutorial on DFPT. You might find additional material, related to the present section, in [Gonze1997a] -especially section IX-, [Lee1995] and [Baroni2001]. If you haven’t read parts of these references, we strongly advise you take the time to read them now. In short, the idea is that, in order to compute properties for which the phonon frequencies are needed in the full Brillouin zone, one can use an elaborate Fourier interpolation, so that only few dynamical matrices need to be computed directly. Others will be computed by interpolation. A schematic representation of the different steps required to compute the dynamical matrix in the IBZ and post-process the results with anaddb is given below. Let us have a look at the input file trf2_1.in. # with kpt mesh so that only one set of GS wave functions is needed. # file as qpt set. Set nstep=1 so only one iteration runs. #  be explicitly turned off for dataset 1. #Set 3 : Response function calculation of Q=0 phonons and electric field pert. 0.5  0.5  0.0   # that is, the default. # type 2 is the Arsenic. typat   1 2       # The first is of type 1 (Al), the second is of type 2 (As). # is described in the "dielng" input variable section. # The dielectric constant of AlAs is smaller that the one of Si (=12). The calculation is done for AlAs, the same crystalline material as for the first tutorial on DFPT. Many input parameters are also quite similar, both at the level of the description of the unit cell and for the choice of cut-off energy and k point grid. Still, this input file is rather complex: in one single run, one produces the Derivative Databases (DDBs) needed for the rest of this tutorial. So, it starts with a ground-state calculation (dataset 1), followed by the computation of the response to the d/dk perturbation (dataset 2), and the response to electric fields, and phonons at Gamma (dataset 3). 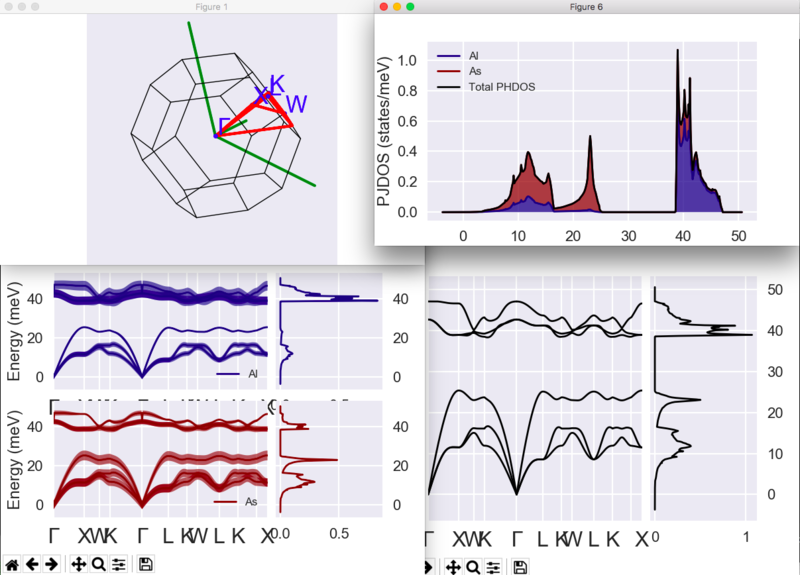 Datasets 4 to 10 generate the dynamical matrices at 7 q wavevectors, other than Gamma. At present (v8.6), one can only compute one q point per dataset, that is why so many datasets are needed. Also, the values of these q wavevectors are not determined automatically. They must correspond to the q wavevectors needed by the ANADDB utility (see later), that is, they should form a reduced set of symmetry-inequivalent wavevectors, corresponding to a regularly spaced grid. In principle, they might not include the Gamma point, but it is recommended to have it in the set, in order for the Fourier interpolation not to introduce errors at that important point. In order to minimize the number of preliminary non-self-consistent calculations, it is advised to take a q point mesh that is adjusted to the k point mesh used for the electronic structure: all q wavevectors should connect two k point wavevectors from this grid. Such a set of q wavevectors can be generated straightforwardly by running a GS calculation with kptopt = 1, nshiftk = 1, shiftk = 0 0 0 (to include gamma) and taking the output kpt set file as this qpt set. One might set nstep = 1 and nline = 1, so only one iteration runs, or even nstep = 0 and prtvol = -1, so no real DFT calculation is done. It is, as promised, the same as the q point set in the trf2_1.in file. Now, it might be worth to examine in some detail one of the Derivative Database that has been created by the trf2_1 run. We suppose that the file trf2_1o_DS3_DDB has already been created. It corresponds to the third dataset, namely the response to q = 0 and electric field. Open this file, and read the 6.5 section of the respfn help file. Examine the trf2_1o_DS3_DDB file carefully. Seven other similar files will be generated by the trf2_1 run, containing the same header, but a different 2DTE block. It will be the duty of the MRGDDB utility, next section, to gather all these information and merge them into a single DDB file. Now, there might be two possibilities: either the trf2_1 run is finished, and you can continue the tutorial with the section 2 about the MRGDDB utility, or the run is not finished. In the latter case, instead of waiting for trf2_1 to be finished, we suggest you to pursue with section 3. You will use as DDB file the one that can be found in $ABI_TUTORESPFN/Refs, with the name trf2_3.ddb.out, instead of the one that would result from the section 2. Copy this file to the present directory, then go to section section 3 of this tutorial. You might come back to section 2 afterwards. The use of the MRGDDB utility is described in its help file. Please, read it carefully now. Use MRGDDB to create the merge DDB from the eight DDB’s corresponding to datasets 3 to 10 of the trf2_1 job, containing the dynamical matrices for the 8 q points, as well as the response to the electric field (dielectric tensor and Born effective charges). Name the new DDB trf2_3.ddb.out. Including also the DDB from dataset 1 won’t hurt (it contains the forces and stresses), but is not needed for the computation of phonon band structure, interatomic force constants, and thermodynamical properties. File $ABI_TUTORESPFN/Input/trf2_3.in is an example of input file for MRGDDB. An introduction to the use of the ANADDB utility is described in its help file. Please, read it carefully. Please, take some time to read the description of each of these flags. Note that some of these flags might be required to allow to run another task. In this tutorial, we will focus on the flags ifcflag and thmflag. You can copy the files trf2_4.in and trf2_4.files from $ABI_TUTORESPFN/Input to the Work_rf2 directory. Open the file trf2_4.in. Note that ifcflag is activated. chneut   1     ! Charge neutrality requirement for effective charges. Unfortunately, the names of input variables and their meaning is not exactly the same as the names used to generate the k points in ABINIT. This is a shame, a remnant of history. Please read carefully the documentation that describes these input variables. Please, read carefully the explanation for these input variables. Here also, spend some time to read the associated documentation. It will last only a few seconds. The file trf2_4.out contains the list of interatomic force constants, as well as some analysis. .Copyright (C) 1998-2018 ABINIT group . ANADDB comes with ABSOLUTELY NO WARRANTY. Corning Inc. and other collaborators, see ~abinit/doc/developers/contributors.txt . acknowledgments of the ABINIT effort. For more information, see https://www.abinit.org . .Starting date : Thu 12 May 2016. Homogeneous q point set in the B.Z. of the generic atom along z.
anaddb : the run completed succesfully. The interatomic force constants are output for the nuclei specified by the input variable atifc. Here, only atom 1 is considered. The IFCs with respect to the other nuclei is given, by order of increasing distance. For each pair of nuclei involving atom 1, there is first the output of the IFCs in cartesian coordinates, as well as their decomposition into an Ewald and a short-range part, then, the analysis with respect to a local system of coordinate. The latter is chosen such that it diagonalizes the IFC tensor, in case of the self-force constant, and in the other cases, the first vector is the vector joining the two nuclei, in order to decompose the IFC into a longitudinal and a transverse component. You can copy the files trf2_5.in and trf2_5.files from $ABI_TUTORESPFN/Input to the Work_rf2 directory. Then open trf2_5.in.
! dealing with gamma LO-TO splitting issue.
! splitting at gamma. Note that gamma occurrs twice. Note that ifcflag is again activated. Indeed, in order to compute a phonon band structure using the Fourier interpolation, the IFCs are required. This is why the two first groups of variables, needed to generate the IFCs are still defined. The third group of variables is now restricted to dipdip only. The file trf2_5.out contains the list of eigenvalues, for all the needed q-wavevectors. You can iopen it, and have a look at the different sections of the file. Note that the interatomic force constants are computed (they are needed for the Fourier interpolation), but not printed. .Starting date : Mon  5 Jun 2017. Please, open also the other output file, named trf2_5_B2EPS.freq. It contains the frequencies, in a format suitable for graphical output, using the program band2eps (the latter should be more documented, and will not be described in the present tutorial). #Input file for 'band2eps.' This data layout must be used, line-by-line. #%% description = Input file for 'band2eps.' This data layout must be used, line-by-line. You should see a nice phonon band structure for AlAs. Well, not so nice, after all, because there are two strange dips for the highest phonon band, at the Gamma point. You can correct the LO-TO splitting by the following little hack. Now, run band2eps again. Your phonon band structure should be perfect! It can be compared with the AlAs phonon band structure published in [Giannozzi1991]. Of course, one should make a convergence study, on the k and q point grids (separately! ), as well as on the energy cut-off, and also test LDA and GGA… But this is left to the user! You can have a look at the paper [Petretto2018] for a careful analysis of phonon dispersion convergence with Abinit. # otherwise abiview does not know how to handle our file. 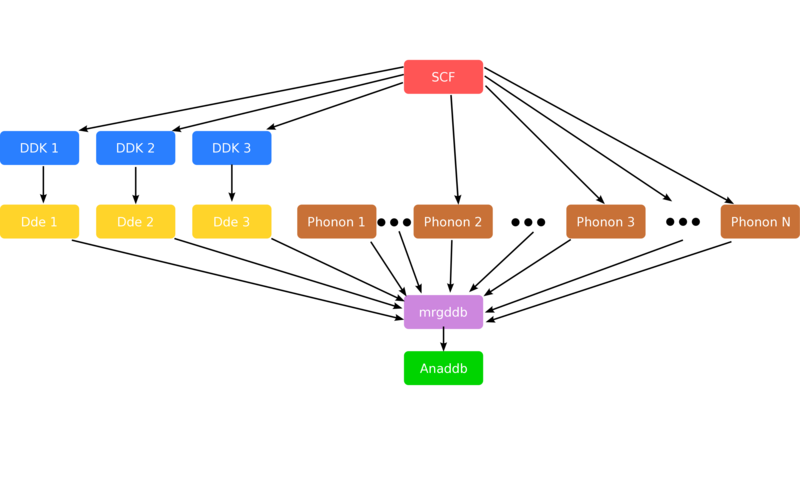 We can also compare our results with the phonon band structure available on the materials project . # Spglib space group info (magnetic symmetries are not taken into account). For further information on the AbiPy API, please consult the DdbFile notebook . To learn how to automate DFPT calculations with Python, see this jupyter notebook. We will give only a very short example of the use of ANADDB to compute thermodynamical properties. This is because this part of ANADDB is likely the farthest from a clean, stable, usage. By exploring the input variables, the user should be able to produce figures and data like the ones for SiO2 quartz and stishovite, published in [Lee1995]. You can copy the files trf2_7.in and trf2_7.files from $ABI_TUTORESPFN/Input to Work_rf2 and have a look at them. The same DDB as for trf2_4 and trf2_5 is used, namely trf2_3.ddb.out. Do not forget that we are working in the harmonic approximation; beyond some temperature, anharmonic effects will have a sizeable contributions.